Social norms differ from culture to culture. For example, a deviant act can be committed in one society but may be normal for another society. Perception of deviance alters over time, as the notion of what is a social norm often changes. The violation of norms can be categorized as two forms of deviance. Formal deviance and informal deviance. "Falsely accusing" an individual - others perceive the individual to be obtaining obedient or deviant behaviors. 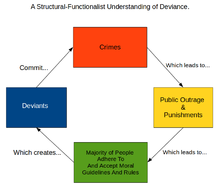 "Pure deviance", others perceive the individual as participating in deviant and rule-breaking behavior. "Conforming", others perceive the individual to be participating in the social norms that are distributed within societies. Deviant acts can be assertions of individuality and identity, and thus as rebellion against group norms of the dominant culture and in favor of a sub-culture. In a society, the behavior of an individual or a group determines how a deviant creates norms. Three broad sociological classes exist that describe deviant behavior, namely, structural functionalism, symbolic interaction and conflict theory. Structural functionalists are concerned with how various factors in a society come together and interact to form the whole. The work of Émile Durkheim and Robert Merton have contributed to the Functionalist ideals. When social deviance is committed, the collective conscience is offended. Durkheim describes the collective conscience as a set of social norms by which members of a society follow. Without the collective conscience, there would be no absolute morals followed in institutions or groups. Altruistic suicide occurs when one is too socially integrated. Egoistic suicide occurs when one is not very socially integrated. Anomic suicide occurs when there is very little social regulation from a sense of aimlessness or despair. Fatalistic suicide occurs when a person experiences too much social regulation. In his differential association theory, Edwin Sutherland posited that criminals learn criminal and deviant behaviors and that deviance is not inherently a part of a particular individual's nature. When an individual's significant others engage in deviant and/or criminal behavior, criminal behavior will be learned as a result to this exposure. He argues that criminal behavior is learned in the same way that all other behaviors are learned, meaning that the acquisition of criminal knowledge is not unique compared to the learning of other behaviors. Frank Tannenbaum and Howard S. Becker created and developed the labeling theory, which is a core facet of symbolic interactionism, and often referred to as Tannenbaum's "dramatization of evil". Becker believed that "social groups create deviance by making the rules whose infraction constitutes deviance". Labeling is a process of social reaction by the "social audience", (stereotyping) the people in society exposed to, judging and accordingly defining (labeling) someone's behavior as deviant or otherwise. It has been characterized as the "invention, selection, manipulation of beliefs which define conduct in a negative way and the selection of people into these categories [....]"
Labeling theory, consequently, suggests that deviance is caused by the deviant's being labeled as morally inferior, the deviant's internalizing the label and finally the deviant's acting according to that specific label (in other words, one may label the "deviant" and they act accordingly). As time goes by, the "deviant" takes on traits that constitute deviance by committing such deviations as conform to the label (so the audience has the power to not label them and have the power to stop the deviance before it ever occurs by not labeling them). Individual and societal preoccupation with the label, in other words, leads the deviant individual to follow a self-fulfilling prophecy of abidance to the ascribed label. Community stigmatizes the deviant as a criminal. Broken windows theory states that an increase in minor crimes, such as graffiti, will eventually lead to and encourage an increase in larger transgressions. This would show that greater policing on minor forms of deviance would lead to a decrease in major crimes. This theory has been tested in a variety of settings, one of which was New York City in the 90s. Compared to the country's average at the time, violent crime rates fell 28 percent as a result of the campaign. Critics of the theory question the direct causality of the policing and statistical changes that occurred. Containment theory is considered by researchers such as Walter C. Reckless to be part of the control theory because it also revolves around the thoughts that stop individuals from engaging in crime. Reckless studied the unfinished approaches meant to explain the reasoning behind delinquency and crime. He recognized that societal disorganization is included in the study of delinquency and crime under social deviance, leading him to claim that the majority of those who live in unstable areas tend not to have criminal tendencies in comparison those who live in middle-class areas. This claim opens up more possible approaches to social disorganization, and proves that the already implemented theories are in need or a deeper connection to further explore ideas of crime and delinquency. These observations brought Reckless to ask questions such as, "Why do some persons break through the tottering (social) controls and others do not? Why do rare cases in well-integrated society break through the lines of strong controls?" Reckless asserted that the intercommunication between self-control and social controls are partly responsible for the development of delinquent thoughts. Social disorganization was not related to a particular environment, but instead was involved in the deterioration of an individuals social controls. The containment theory is the idea that everyone possesses mental and social safeguards which protect the individual from committing acts of deviancy. Containment depends on the individuals ability to separate inner and outer controls for normative behavior. There are three sections of the criminal justice system. These sections include police, courts, and corrections system. These groups function to enforce formal deviance. Corrections system: Community-based corrections include probation and parole. These programs lower the cost of supervising people convicted of crimes and reduce prison overcrowding but have not been shown to reduce recidivism. ^ a b c d e f g h i j k l m n Macionis, J.; Gerber, L. (2010). Sociology (7th Canadian ed.). Toronto: Pearson. ISBN 978-0-13-511927-3. ^ Heckert, Alex (September 2002). "a new typology of deviance:integrating normative and reactivist definitions of deviance". Deviant Behavior: An Interdisciplinary Journal. 23: 449–479 – via SOCindex. ^ a b c "OpenStax CNX". cnx.org. Retrieved 2019-02-28. ^ "7.1B: Norms and Sanctions". Social Sci LibreTexts. 2018-07-30. Retrieved 2019-04-22. ^ "7.1E: The Functions of Deviance". Social Sci LibreTexts. 2018-07-30. Retrieved 2019-04-22. ^ Macionis and Gerber, John, Linda (2010). Sociology (7th Canadian ed.). Toronto, Ontario: Pearson Canada Inc. p. 200. ISBN 978-0-13-700161-3. ^ a b c d e f 1969-, Conley, Dalton,. You may ask yourself : an introduction to thinking like a sociologist (Fifth ed.). New York. ISBN 9780393602388. OCLC 964624559. ^ Paternoster, R.; Mazerolle, P. (1994). "General Strain Theory and Delinquency: A Replication and Extension". Journal of Research in Crime and Delinquency. 31 (3): 235. doi:10.1177/0022427894031003001. ^ Griffin, Em (2012). A first look at communication theory. New York: McGraw-Hill. p. 54. ISBN 978-0-07-353430-5. ^ Charon J.M. (2007). Symbolic Interactionism: An Introduction, An Interpretation, Integration. Upper Saddle River, NJ: Perason Prentice Hall. ^ Meltzer B.N., Petras J.W. & Reynolds L.T.(1975). Symbolic Interactionism: Genesis, Varieties, and Criticism. Boston: Routledge and Kegan Paul. ^ a b Ed. Botterweck, Michael C. et al. (2011) "Everyday Sociology", p 152. Starpoint Press, Elmhurst, IL. ^ Mitchell, Jim; Dodder, Richard A. (1983). Types of Neutralization and Delinquency. Journal of Youth and Adolescence. 12. pp. 307–318. doi:10.1007/BF02088729. ^ Howard S. Becker. Outsiders: Studies in the Sociology of Deviance. (New York: The Free Press, 1963). ISBN 978-0-684-83635-5. ^ a b c Macionis, J.; Gerber, L. (2010). Sociology (7th Canadian ed.). Toronto: Pearson. p. 204. ISBN 978-0-13-511927-3. ^ Greene, Jim (2018). Broken windows theory. Salem Press Encyclopedia. ^ Flexon, Jamie L. (2010). "Reckless, Walter C.:Containment Theory". In Cullen, Francis T.; Wilcoz, Pamela (eds.). Encyclopedia of Criminological Theory. Thousand Oaks, Calif.: SAGE Publications. pp. 777–782. ISBN 9781412959186. ^ Wadsworth, T. (2000). "Labor Markets, Delinquency, and Social Control Theory: An Empirical Assessment of the Mediating Process". Social Forces. 78 (3): 1041. doi:10.1093/sf/78.3.1041. ^ Steiner, Benjamin, and John Wooldredge. "The relevance of inmate race/ethnicity versus population composition for understanding prison rule violations." Punishment & Society 11(2009):459–489. "Types of Deviance." Web. 23 Feb. 2012. <https://web.archive.org/web/20120215133912/http://plato.acadiau.ca/courses/soci/thomson/criminaljustice/deviance/deviance.htm>. "Emile Durkheim"s Basic Insight" Macionis, J., and Gerber, L. (2010). Sociology, 7th edition.